When you order a table from us you can rest assured of two things…it will be great looking…and it will hold up to heavy duty, every day use. Designed for commercial applications, yet perfect for your kitchen or game room. In our opinion, there is not a better made base out there. Speak with one of our customer service reps to determine the base most appropriate for your table. 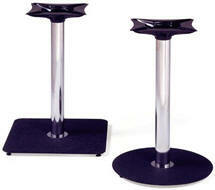 For pricing information on our table bases give us a call at 304-728-0547. Or send us an email and one of our retro specialist will respond right away. We offer a great commercial customer discount when ordering in large quantities. Let us help you build your diner or retro restaurant. “Classic” flat steel design. Black bottom with chrome column is standard. Black column available at no extra cost.